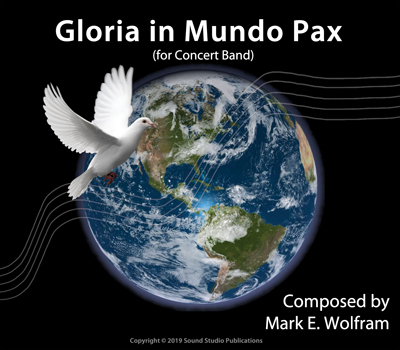 "Gloria in Mundo Pax" by Mark Wolfram is an original composition for concert band with harp and pianoforte (and optional organ). The work was commissioned by Dr. Earl C. Benson and the Medalist Concert Band of Bloomington, Minnesota to celebrate the 50th anniversary of the ensemble. The premiere was on March 3, 2019 at the Schneider Theater in the Bloomington Center for the Arts. While not a programmatic work, “Gloria in Mundo Pax” (translated from the Latin to "Hymn to World Peace") explores the struggle between harmony and dissonance, positive and negative, and good versus evil. Sometimes human strife dominates, leaving little room for harmony and peace - and at other times the soothing, powerful balm of love and understanding prevail over the din of troubled times. As in life, the musical discord of this work is potent and persistent. Ultimately, however, the piece progresses to a place of triumphant, joyous harmony. The composer describes this work as "an allegory for our times in which we must strive to create and maintain a better world for all." "Gloria in Mundo Pax" is a GRADE 5 concert band composition which highlights angular melodies, colorful sonorities, time signature changes, tertian, quartal and serial composition in an exciting blend which is both intellectually satisfying and aesthetically pleasing. The work has a duration of approximately 9:40. Please email us if you have any trouble with online ordering. If additional single parts are needed, they are available for $1.00 each and only when you purchase of a full set. To order using check or money order CLICK HERE for printable order form.